February 25, 2013 By Tina M 7 Comments This post may contain affiliate links. Read my disclosure policy here. 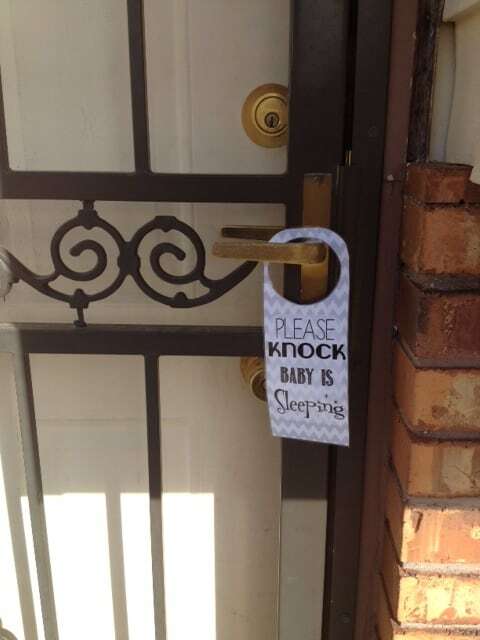 I remember the good ‘ol days when I was out doing a fundraiser as a kid and I would come upon a door that said, “please knock, baby is sleeping.” I also remember wondering why mothers were so paranoid about their babies waking up. I don’t wonder anymore. Nap time is an amazing time of day, and any chance of it getting shortened puts me in nothing short of a panic. Don’t get me wrong, I adore my little girl and I love being her mom…but it’s those magical nap times that allow me to keep loving her. 🙂 My husband often times comes home for lunch which is usually right around her nap time. Far too many times he comes triumphing through the front door, and shuts it just a little too…man-like. After many frustrating occurences of trying to get her back to sleep after he has left, I almost like a trained dog when it comes to the front door. The moment I hear him coming in, I jump up in a panic and as quickly as possible, run to the front entry and utter the words “Shhhh…she’s sleeping, shut it softly!” I’m sure the whole pathetic display of paranoia is quite entertaining to my husband, but I feel it’s all worth my efforts. Can anyone relate to this panicked craze? My little girl is at the stage where she wants me to hold her all day long, so nap time is when I kick into power mode and get something done (or now that I’m pregnant it often times becomes my own nap time). 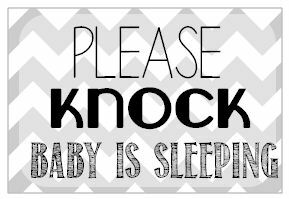 So Without further ado, if you find yourself to be one of those moms that panics at the sound of the doorbell, I have made a printable door sign for you! 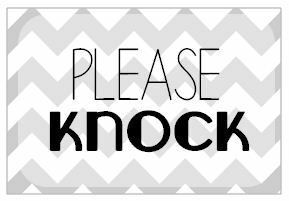 Most of the times that I have seen one of these “please knock” signs, it has been quickly written on a sticky note or a scratch piece of paper. I decided to make a cute version that can be used repeatedly. 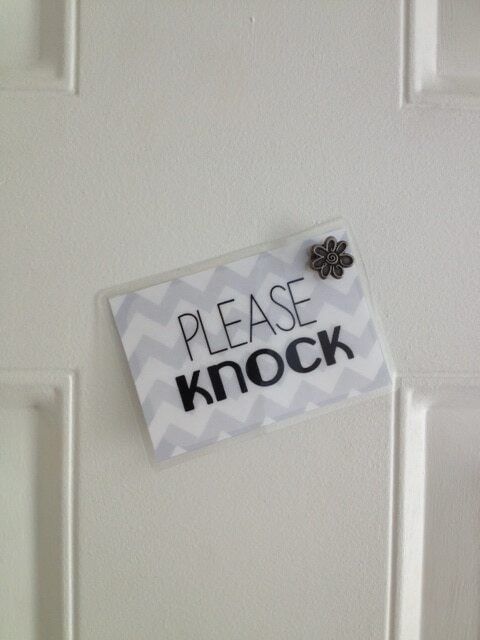 The first version is a printable door tag. I printed and laminated mine for longer use. This would also make a cute tag to tie to a baby shower gift. 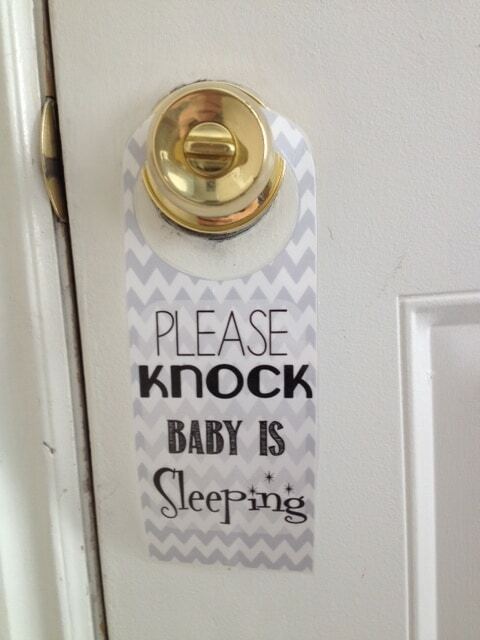 Every new mom deserves one of these already made for her! 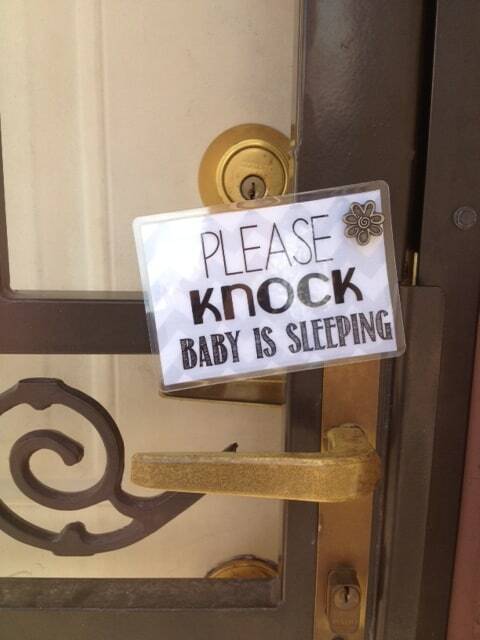 If you don’t have a baby and you just want a “please knock” sign (maybe your doorbell doesn’t work? ), then this one is for you! Go here to read about getting your baby into a good nap routine. Completely understand and agree with this. This happens when both my older kids barge in during baby nap time! Very cute and completely necessary around these parts. My son sleeps very poorly at night and during naps so if I actually get him to sleep, I try at all costs to keep him asleep. My dog is usually the problem more than the doorbell. Thanks for the printable! Beth, thanks for validating that I’m not crazy (or maybe we both are). 🙂 I wish I could make a printable to help with the dog…good luck! What a very kind comment! God bless you and Merry Christmas!